Make or buy a fresh evergreen wreath. Trader Joe's has inexpensive fresh boxwood wreaths every Christmas in the Fort Worth area. Fresh fir wreaths are also nice to use because their sprigs hang down all around the vine wreath. 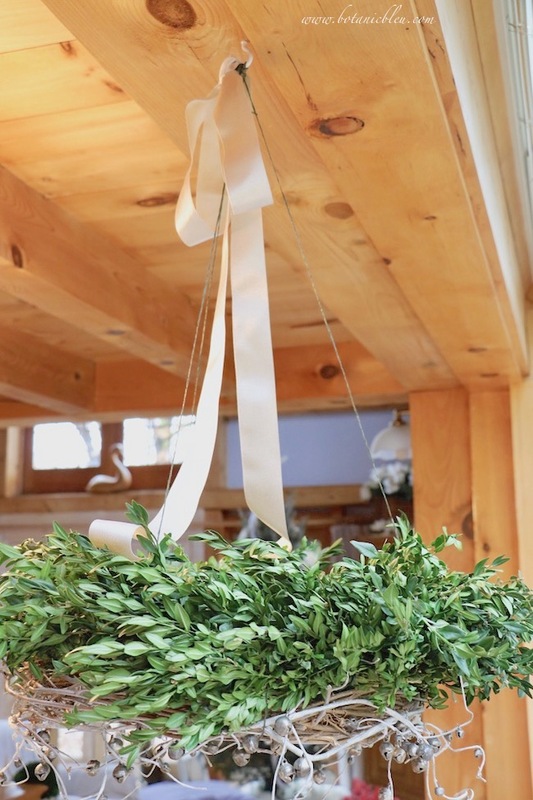 The wreath shown has a silver bell garland that is attached to the white vine wreath BEFORE attaching the white vine wreath to the boxwood wreath. Alternate ornamental garlands that can be used are small metal snowflakes or stars. Another pretty option is a garland made with battery operated twinkle lights. If a similar garland is not available, small Christmas ornaments can be hung from the wreath as the final step. 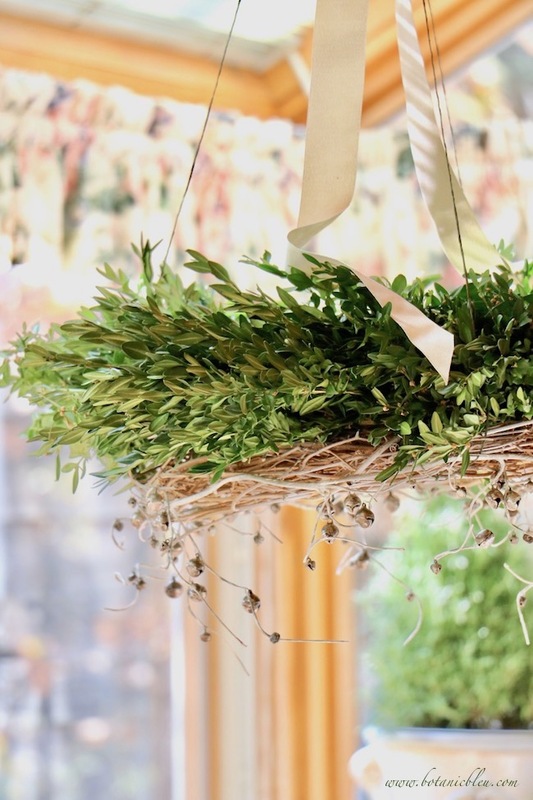 Use green florist wire to wire the boxwood and vine wreaths together in 3 or 4 places. Wrap the wire all the way around the green wreath and the vine wreath instead of using a small piece of wire to connect the two wreaths. Twist the ends of the wire together several times and tuck in between the two wreaths to hide the end. Green florist wire blends into the background of the green of the wreath and is not noticeable. Look how hard it is to see the green wire in the photo above. Attach a medium-sized cup hook to a wood beam. If your ceiling is sheetrock, ask at your local hardware store for a hook that can hang from sheetrock. Attach 3 long strands of florist wire to your two wreaths. Make your 3 wire lengths longer than you think you need. After you finish hanging the wreath, you can trim off excess wire. 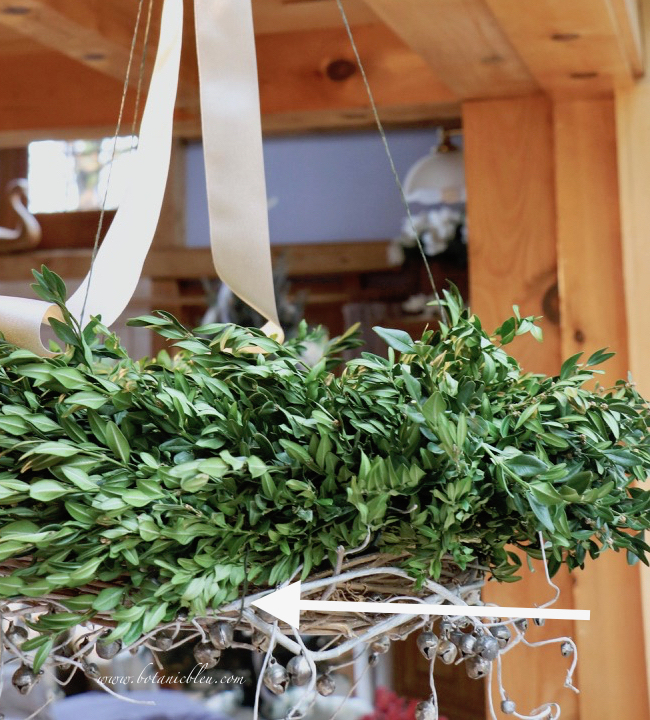 Wrap the wire all the way around both the vine and boxwood wreaths. 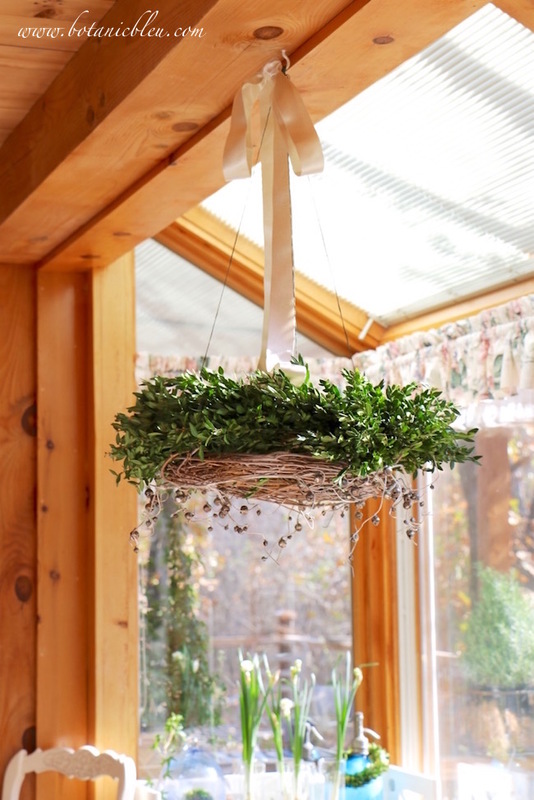 Tie the wire so the knot is hidden by the boxwood wreath and one end of the wire is left long to tie to the ceiling hook. 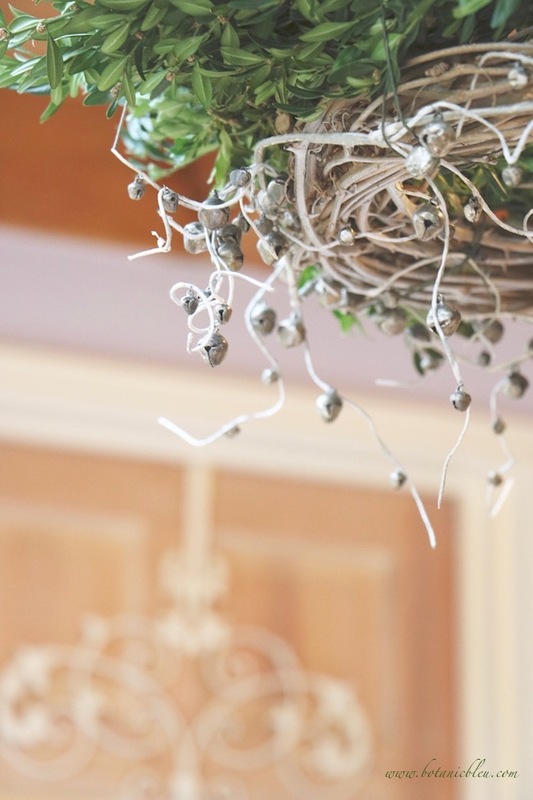 Ask someone to help you when you begin to hang the wreath from the ceiling hook. Two sets of hands are needed to get the wreath level. Space the 3 wires 120° apart (equally spaced around the circular wreath.) They don't have to be perfectly spaced, but the closer to perfect spacing, the better the wreath will hang level. Position the hanging wreath over the center of the table so people do not hit their heads on it. 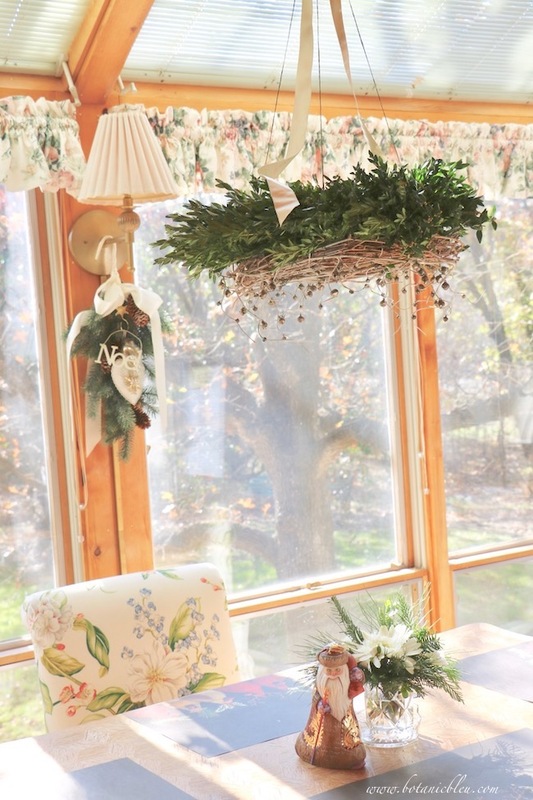 Hang the wreath at least 30" above the table. The one shown is 31" above the table and 34" below an 8' ceiling. The wood beam is 8" thick and the wreath hangs 26" below the wood beam. Tie the first of the 3 wires to the hook. Then pull the other 2 wires up to the hook, allowing them to work independently of one another as you and your helper raise and lower those 2 wires to get the wreath level. Once the wreath is level, tie the 2 remaining wires to the hook, and wrap the ends of all 3 wires AROUND the top of the wires to secure the wreath. Tie the 3 wires together and trim any excess ends. 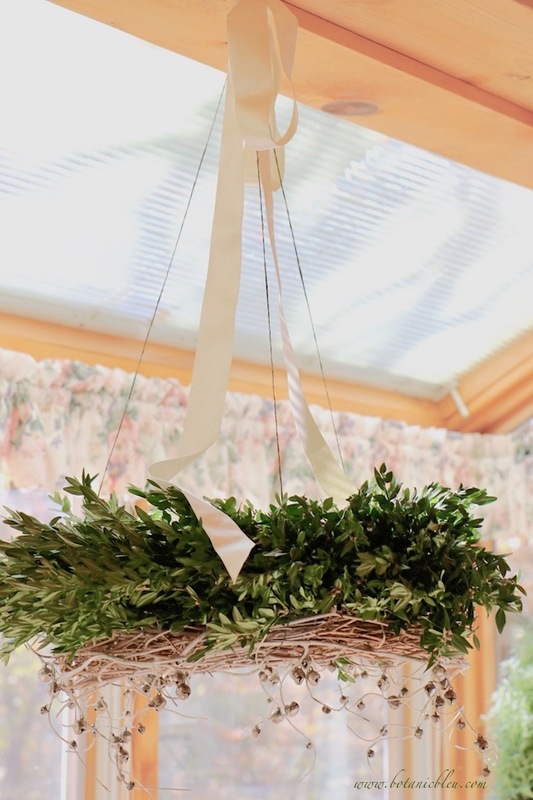 If the wreath is not level after tying all 3 wires to the hook, adjust the wreath's level by choosing the longest wire that is causing the wreath to hang uneven, and wrap that wire around the hook as many times as needed until you get the wreath raised enough on that side to become level. Note: Use only 3 wires to hang the wreath. More than 3 wires compound problems in leveling the wreath. Remember from high school geometry: 3 points determine a plane. Make a bow from a wide ribbon leaving 2 tails long enough to drape onto the wreath. AFTER the bow is made, slip the ceiling hook through the back of the knot of the bow to hang the bow. Then loosely drape the 2 tails over the wreath. THE BOW DOES NOT SUPPORT THE WEIGHT OF THE WREATH. 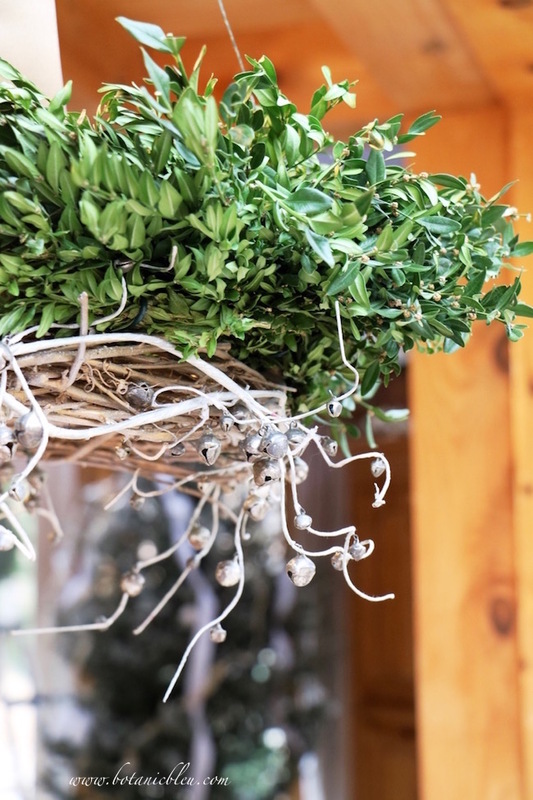 If a decorative garland was not attached to the white vine wreath in the beginning, small Christmas ornaments can be hung individually from the vine wreath. Use ornament hangers to hang ornaments or use ribbon to hang ornaments at varying lengths below the wreath. More Christmas posts are coming your way... tablesettings, gift wrapping ideas, Christmas decor, Christmas tree details... so much to share to make your holiday merry and bright. 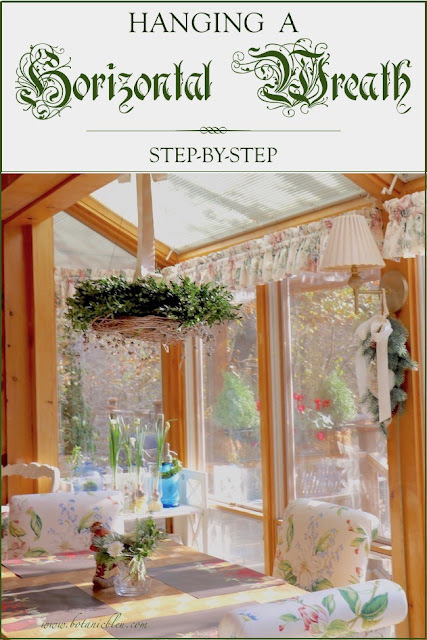 That wreath looks great above your table! Thanks for the inspiration and tips, Judith. Did you sell the buffet and mirror? Was hoping to catch a glimpse of them. 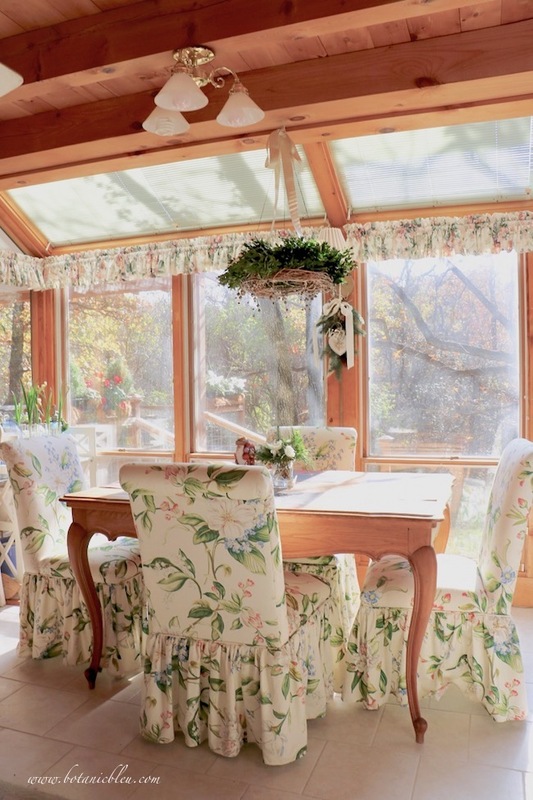 I love your dining area. What a fun place to enjoy a meal. The wreath is darling and those tiny bells are so complimentary to it. This is wonderful. Thanks for sharing. I've pinned it. I love, love, love this idea.